This image was created for the PNG development group for finding the display gamma of various systems in a simple manner. Unless you have a truecolor video system, do not attempt to use the image while viewing it online, since your browser will be changing the colors to compensate for other colors on the screen. The best method is to save the image, and then view it with a good image viewer that will display the correct intensities. Also ensure that the image is not enlarged or reduced in any way by the viewing program, as this will also ruin its effectiveness. For viewing the gamma image darken the room and set the monitor brightness and contrast to maximum. While viewing a black screen, lower the brightness gradually until the "background" (ie the scanlines that you see across what should be a black screen) is no longer noticeable (when it just fades from view). This may be difficult on monitors that normally cover the whole visible portion of the display, unless you change the viewable area settings until you can see the actual border where the monitor isn't displaying anything. Now, while viewing the above image, lower the contrast until the alternating white and black bars on the left edges of each column are equal in width. This is trying to get a 50% gray by using half white and half black. If this is not possible, choose a contrast setting which is about in the middle of the available range. 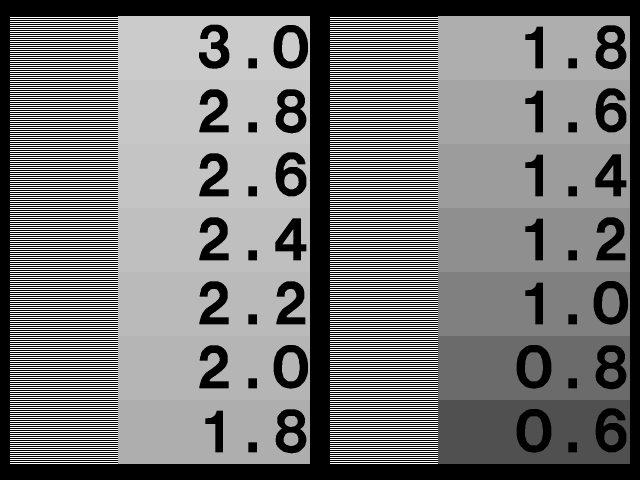 While viewing the image from a distance, or with squinted eyes, one of the numbered "swatches" will best match the gray value approximated by the white and black bars. The number in this "swatch" is your display's actual gamma value. Monitors actually have gamma values in the range 2.0 to 2.6. If your monitor is usually used in a dim environment, we often use a gamma value that is 10% - 20% lower than the actual display gamma to give the images more contrast. Some systems, such as Macs, NeXTs, and SGIs, already do gamma correction, so they may have display gammas of 1.0 or 1.8 or so.